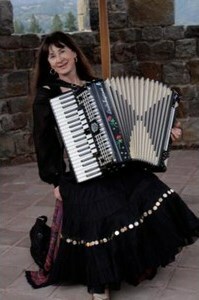 Accordionist Nada Lewis plays music from France, Italy, Bulgaria, Germany, Ireland, Russia, Ukraine, middle east, Serbia/Macedonia, Romania, Greece, Israel, Latin America, Gypsy, Brazilian choro, Scandinavian; Klezmer, and other music. She plays solo or with a band of up to 6 people, including violinist, bass, clarinet, guitar, balalaika/domra, cimbalom (hammered dulcimer), percussion, vocals. She has a world music booking agency (Folkloric Productions) and can help you with other types of music as well; you can find more information and pictures of her on the accordion page of that website. The recordings page has some samples of her east European and Klezmer music. 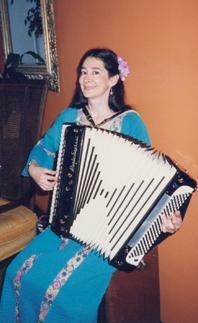 Nada teaches accordion, and also leads folk orchestral ensemble workshops at music camps. She has recorded on a number of albums she produced (6) as well as playing on other musicians' projects. She plays many stringed, percussion, keyboard and wind instruments as well, and is well known in the greater San Francisco bay area as a musician and as a performer at weddings, parties and theme events. Nada is a true professional. Everyone at the party enjoyed her performance, especially my 90 year old mother. She was dressed in a beautiful embroidered blouse and played Eastern European tunes. In fact my brother and sister-in law were so impressed by her that they ant to hire her to play at my niece's graduation party, unfortunately it's in upstate New York. Nada arrived early and set up her equipment and started performing on time. She is a lovely person, dressed in costume and added a wonderful ambiance to our event. We appreciated the tone of her playing; which allowed our group to engage in conversations around our dinner tables. She was very pleasant and accommodating to any request. Nada was prompt and played beautifully. Our party was an intimate one, and so it was nice to have some acoustic accordian music playing in the background. Nada was great. Very professional...showed up on time and dressed in the style of our party (Oktoberfest). she played a good selection of music and was really enjoyable. Added much to the party! Would definitely hire her again. Nada was a delightful addition to our event. She was wonderful to work with and everyone enjoyed her performance. She even did a song with one of our party attendees singing the her music. I would highly recommend Nada and hope to work with her again. Nada plays beautifully. Our guests enjoyed her performance very much. Despite my late booking, Nada was flexible and gracious. She prepared two songs that I had requested, and all of her music befit the occasion. Please note Accordionist Nada Lewis will also travel to Albany, Emeryville, Oakland, Canyon, Piedmont, El Cerrito, Orinda, Richmond, Alameda, El Sobrante, Lafayette, Moraga, Rheem Valley, San Francisco, San Pablo, Hercules, Pinole, Walnut Creek, Martinez, Pleasant Hill, Rodeo, San Leandro, South San Francisco, Tiburon, Concord, Crockett, Port Costa, Alamo, San Quentin, Sausalito.